FORT WALTON BEACH, Florida - A Florida Man was arrested after Okaloosa County Sheriff’s Office deputies found him standing in his driveway naked with a bottle of wine nearby. Around 9:30 p.m. on Sunday, deputies responded to a complaint of a naked man making lewd movements outside his home at 2195 Sapphire Court near Fort Walton Beach, Florida. 60-year old Bobby Hyde stepped behind a trash can when the deputies arrived. 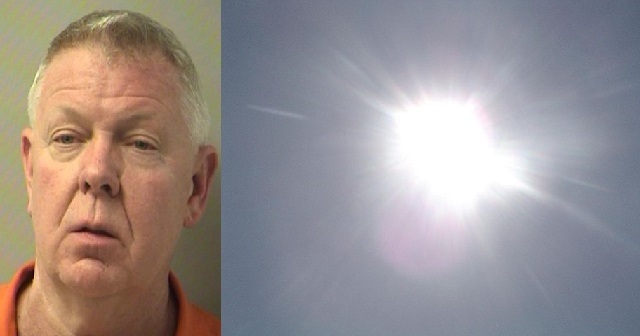 He allegedly told the deputies that it was hot outside and he was just taking out the garbage. The deputies observed that Hyde was standing next to a Jeep in his driveway which had a bottle of wine on the hood. Hyde allegedly admitted to drinking alcohol for several hours before the incident. A woman told deputies that before they arrived, Hyde had been outside facing her residence and was making lewd movements with his hands. She said that Hyde also put his hands over his head as if stretching. Hyde denied making lewd movements or being naked for a thrill-seeking moment. He was charged with indecent exposure.